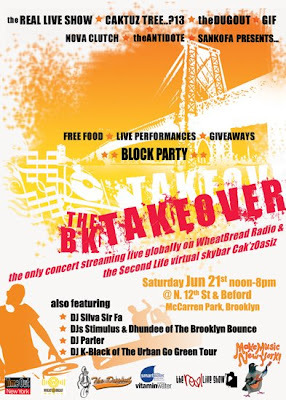 MAKE MUSIC NEWYORK: THE TAKE OVER, this Saturday June 21st @ 12pm. This Block Party is definitely the place to be this first day of summer. The "Take Over" combines some of NYC's most buzz worthy and innovative live bands with some of the region's most notable rising Hip-Hop front runners. With a music tent, street performers, DJs, and FREE BARBECUE, this block party follows the lead of Dave Chappelle's landmark event by taking Brooklyn by storm. DJ Silva Sir Fa, DJ Parler, DJ K-Black of The Urban Go Green Tour & The Brooklyn Bounce.